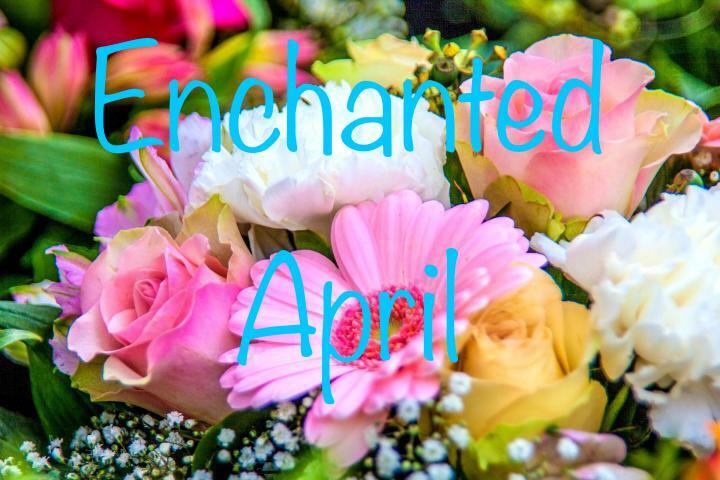 River Company will hold open auditions for “Enchanted April” written by Matthew Barber and based on the book “The Enchanted April” by Elizabeth von Arnim. There are two audition dates: Friday, March 1st from 5:30-7:30 and Saturday, March 2nd from 11–1 pm. Auditions will be in the Porter Hall at Skidompha Library. Performances will be two weekends: April 26,27,28 and May 3,4,5. Please bring along acting resumes if possible and a schedule with known conflicts. Be prepared to fill out an audition form. Sides and character descriptions will be provided. Roles: 5 women and 3 men. We are so pleased to announce that River Company was able to donate $1,400.00 to the food programs at 4 local schools, each program receiving $350 in time for Christmas break. Thank you to our partner Skidompha Library, director Ellie Busby and the entire cast and crew of “The Best Christmas Pageant Ever” - especially all those who came out to see the show and who so generously donated. ​Happy Holidays from River Company! River Company is now on Instagram! Mallory Adams and Torie DeLisle, president and vice president of River Company's board, recently met with Christine Lapado-Breglia of Lincoln County News. The three sat down and discussed the recent partnering of the two non profits and lots more. Click the link to read the article! Would you like to receive River Company's annual newsletter? River Company's official newsletter, "Ripples," is full of great information, including a recap of the previous year, board updates and information for the upcoming season. When you get on our newsletter mailing list, you'll also receive our membership sign up card. 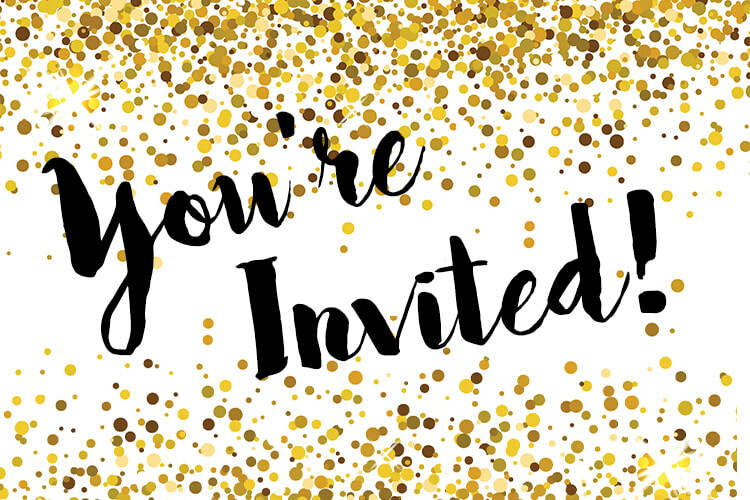 Email rivercompanytheater@gmail.com with your name and address to receive Ripples 2018! Nick Azzaretti was most recently involved in last fall's "Rhinoceros" and "A Christmas Carol"
River Company, in partnership with Skidompha Library, presented "A Christmas Carol" as their annual fundraiser and raised $800 to benefit Healthy Kids. 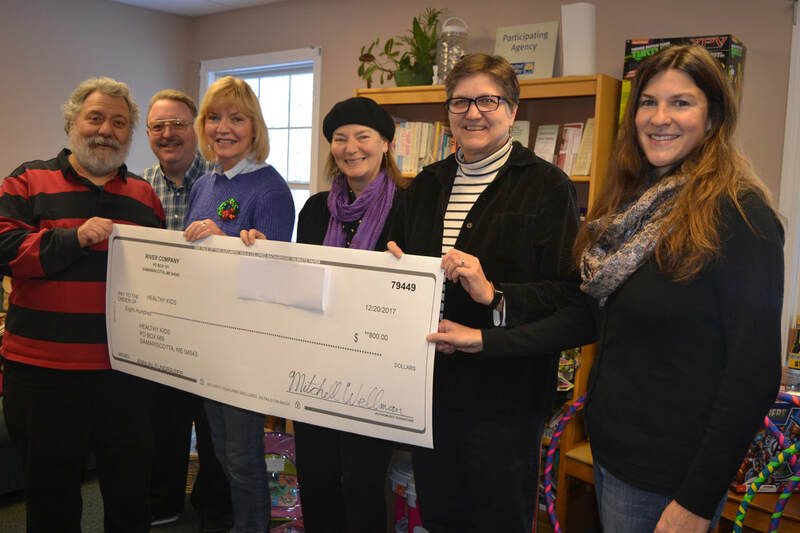 River Company members Mitchell Wellman, Andrea Handel, Judy McQuillen and show director, Nick Azzaretti, presented Healthy Kids' Executive Director Leslie Livingston and board Vice President Alicia Hunter with a check on December 20, 2017. 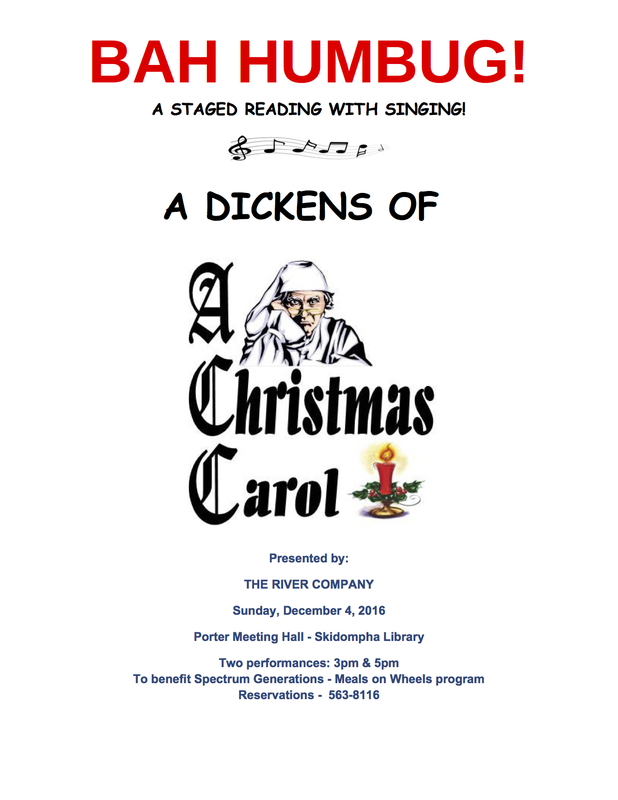 On December 9th, 2017, River Company staged its 8th annual fundraiser with two performances of an adaptation of Orson Welles's 1939 Christmas Eve radio broadcast of "A Christmas Carol." The show was directed by Nick Azzaretti, produced by Phyllis McQuaide and River Company Treasurer Mitchell Wellman starred as Bob Cratchit and was the sound technician. 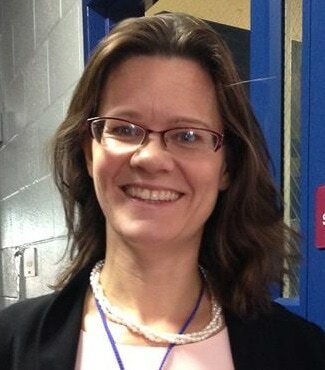 Skidompha Library's Director of Development and Communications, Torie Delisle, assisted with production and promotions. Other local talent that donated their time were Joseph McGrann as Ebenezer Scrooge and John David Adams as the Narrator. The rest of the cast included Ben Meader, Kernan Cross, Mike Rowe, Judy McQuillen, Marie Stickney, John Jenkins, Laurie Brown, Beth Rowe, Savanna Allen, Liam Allen, and Eve Allen. The show was the final production of River Company's 20th Season and its first as the official resident theater company of Skidompha Library. 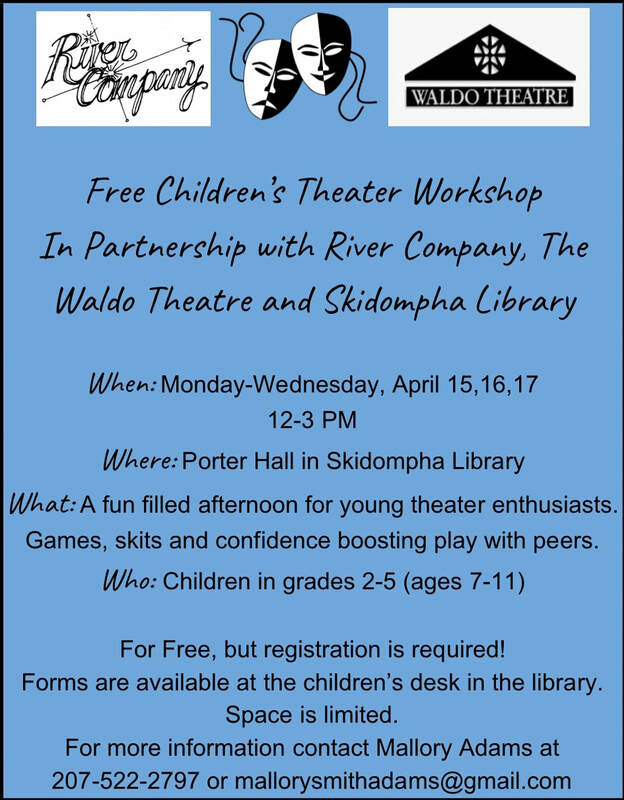 River Company has been performing in Skidompha Library's Porter Hall since 2002 and recently partnered with Skidompha Library with the hopes of presenting more shows together beginning in 2018. Past beneficiaries of River Company's annual fundraiser include: New Hope for Women, CLC YMCA, the Community Energy Fund, Spectrum Generation's Meals on Wheels, ElderCare Network of Lincoln County, the Newcastle Ecumenical Food Pantry, and a Big Brothers, Big Sisters employee who hiked the Appalachian Trail. ​Campbell Playhouse's "A Christmas Carol"
Children and adults needed for parts. All proceeds benefit Healthy Kids. Due to some casting conflicts, River Company will present "Rhinoceros" as a staged reading, with selected scenes with audience discussion for one weekend only: November 10,11,12. Stay tuned for more information! It is with a very heavy heart River Company shares that founder and beloved friend Charlie Waterman passed away Sunday, July 30, 2017.
has family roots in Maine. His parents and relatives had Portland, Houlton, and University of Maine (Orono) backgrounds. In 1957 he graduated from the School of Communication at Northwestern University (Evanston, IL) and went on to earn a commission in the United States Marine Corps. His lasting love in life has been stage acting which he has done professionally in many states, residing for thirty years in both Manhattan and Los Angeles. He worked in national magazine advertising sales, life and disability insurance and real estate management in order to survive, but his raison d'être has always been theatre and its massive body of literature. "Starting to write poetry at age sixty is like stepping onto a Broadway stage for the first time to audition. It takes a beat to overcome the awe before you can speak. These are hallowed halls." Charles has gratefully lived in midcoast Maine since 1990." Charlie approached Tom and Andrea Handel and Ellen Whalley in the spring of 1998 and River Company was born. Charlie directed "No Exit," River Company's very first production staged at the Community Center in the summer of 1998. Charlie took the reigns in the early years with both directing and acting in productions and kept the whole group moving forward. River Company was quickly incorporated and granted nonprofit status. Charlie designed the logo and put together the board by-laws. His early leadership solidified the group's mission and his vision to focus on the art and skill of acting guided River Company through year after year of exciting, new and often risky productions. Charlie bid adieu to the stage in "The Outgoing Tide" in the fall 2016. There will be a graveside service for Charlie on August 16th at 11 AM at the Pine Knoll Cemetery in Newcastle. Open Auditions for River Company's summer show "Vanya and Sonia and Masha and Spike" will be held on Tuesday May 23 6-7:30 and Wednesday May 24 at 7:30-8:30 pm at the LCTV studios just north of Route One on Sheepscot Road in Newcastle. The play, by Christopher Durang, is a comedy that has been described as "a sunny play for gloomy people." The cast of six includes four women and two men. 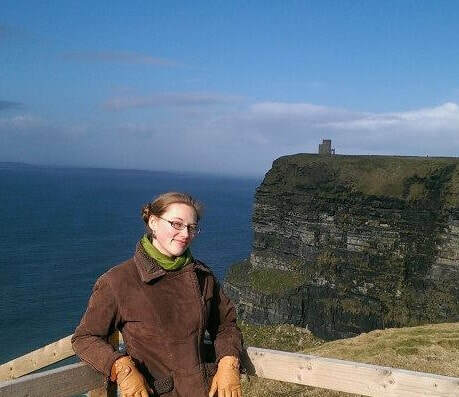 The women include one young woman, two between the ages of 45-60, and one of any age. The male roles are one man under 30, and one man over 50. Be prepared to read a scene, and be able to communicate schedule conflicts for June and July rehearsals for the August 4-6 and 11-13 performances at the Porter Meeting Hall at Skidompha Library. River Company Welcomes New Board Members! This special wine glass, commemorating River Company's remarkable 20th season, will be available only at our production performances, beginning with "Love Letters" on May 14. For just $10, you can join us in toasting to an incredible 20 years and many more to come! River Company announces its impressive 20th season with four exciting productions. The plays are “Love Letters” by A.R. Gurney, “Vanya and Sonia and Masha and Spike” by Christopher Durang, “Rhinoceros” by Eugene Ionesco and finally their annual fundraiser “A Christmas Carol” by Charles Dickens. “Love Letters” starring longtime River Company board member Suzanne Rankin and local favorite Thom Watson will open Mother’s Day, Sunday May 14th for one performance only. The venue is Savory Maine restaurant, located in Damariscotta and will be an exciting dinner and performance combination. Rankin and Watson bring this romantic comedy to life, reading love letters to one another that span their two characters’ lifetimes. The setting and design are simple yet elegant and complements the dining environment. “Love Letters” promises to be a lovely time, a special Mother’s Day treat. Doors open at 6 with the performance beginning at 6:30 with a brief intermission and tickets are $35 per person and include a three course meal. For reservations, please call 207-563-2111. Durang’s Tony award winning play “Vanya and Sonia and Masha and Spike” will have six performances, opening Friday August 4th at 7:30 pm, followed by August 5, 11, 12 at 7:30 pm and August 6 and 13 at 3 pm in the Porter Meeting Hall at Skidompha Library. 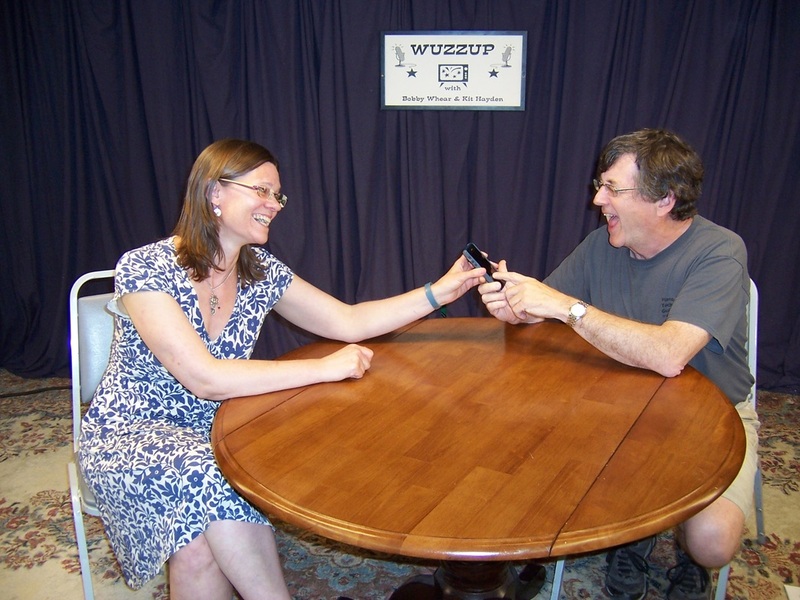 This hilarious comedy centers on three middle aged siblings and their struggle to find love, success and to “grow up.” River Company board member, Allison Eddyblouin, has taken on the role of director and plans to cast the show this June. Open auditions will be held, date, time and location to be determined. “Rhinoceros,” a dark and eye opening three act play will be performed in November, around election day November 7, 2017, the one year anniversary of America’s historic presidential election. The performance dates are November 3,4,10,11 at 7:30 pm and 5 and 12 at 3 pm in the Porter Meeting Hall at Skidompha Library. The play takes place in a small french village and focuses on one character, a man named Berenger, who watches everyone in his town overtaken by “rhinoceritis,” a sickness that turns one into a rhinoceros. The play serves as an allegory for the second world war and the conversion and conformation of many people into anti-semites, and eventually nazis. The season will end with a rendition of “A Christmas Carol” starring hometown talent during the month of December. Dates and times have yet to be confirmed. The performances will benefit a local charity. 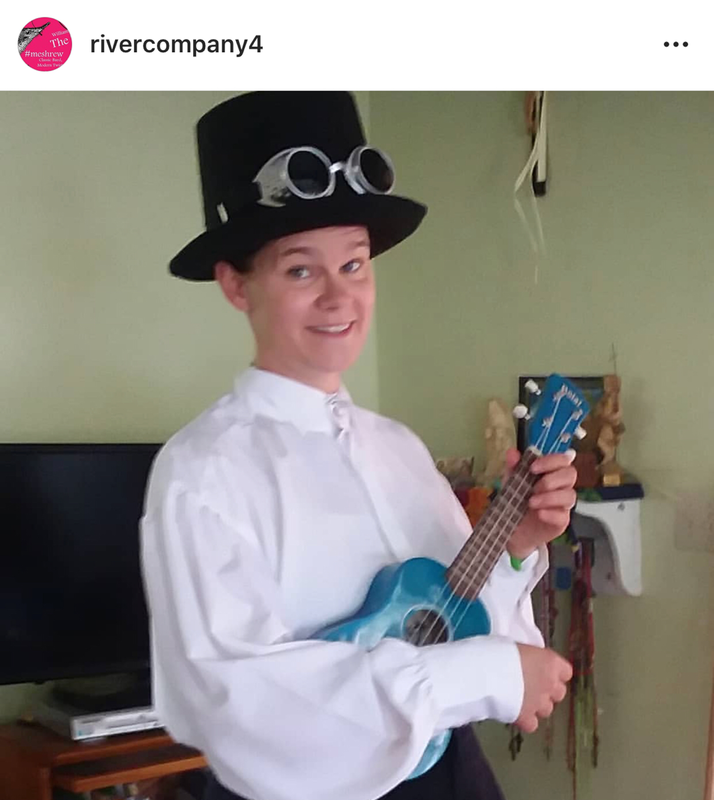 River Company is a non-profit, 501(c)3 corporation comprised of experienced local actors who produce dynamic, minimal-style theatre, written by major playwrights, focusing on acting. For more information, visit our website www.rivercompany.org or to sign up for our newsletter or become a member call 207-563-8116. Ripples 2017 coming to you this May! Congrats to River Company's 2017 Officers! Back by popular demand, this fall River Company will reprise Bruce Graham's The Outgoing Tide opening in Boothbay in the Town Hall Building of the Boothbay Railway Village on Sunday September 25th at 7PM as well as 2 performances at Skidompha Library in Damariscotta the following weekend. Thanks to contributions from two generous Boothbay region sponsors, the Boothbay Railway Village performance will be offered as a free event to the public. River Company is offering the play this year as a staged reading and is directed by Andrea Handel. 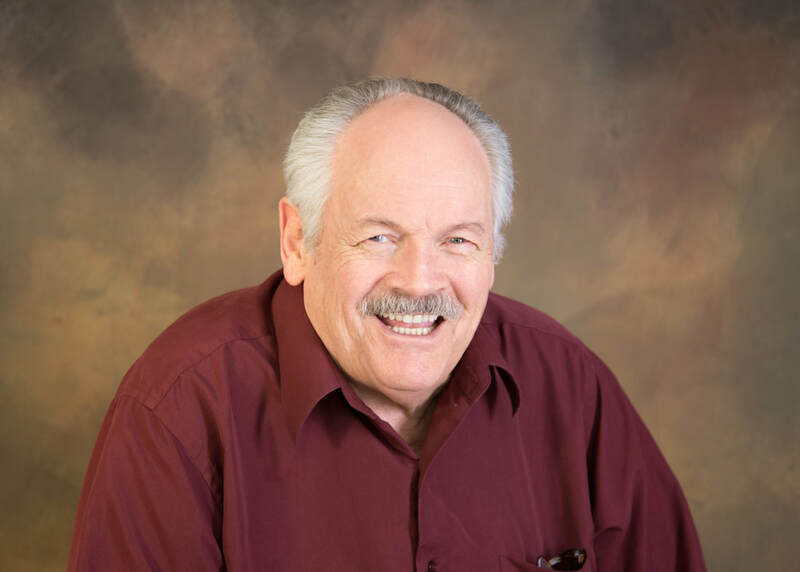 In the cast is Charles Waterman as Gunner who moved audiences last year with his memorable portrayal of an older man diagnosed with dementia who is painfully aware of the losses he's facing and what this will mean for his family. Mitchell Wellman returns as Jack, his middle aged son going through a divorce while trying to support his aging parents. New to the cast this fall is Suzanne Rankin as Peg, Gunner's wife who is grappling daily with how to care for Gunner and assure his safety as his dementia progresses. This extremely well-written drama is laced through and through with realistic, humorous family situations and conversations that inspire empathy in audience members and provide relief from the developing serious and heart wrenching challenge faced by Gunner and his family. Gunner, a man determined not to be a victim of his unfortunate diagnosis, concocts his own plan to deal with his end of life issues and save his family from the unfolding circumstances in which they find themselves. He endeavors to persuade his wife and son to see his point of view as the story moves toward its poignant conclusion. In a departure from the norm, River Company held auditions and cast Love/Sick last month and actors/directors are currently deep in rehearsal. Well-known River Company board member Mitchell Wellman is at the helm as director of 7 of the 9 vignettes that make up this comedy by Maine playwright John Cariani. Mallory Adams and Tyson Bailey debut as directors and each direct a scene from Cariani's play that has been billed as Almost Maine's "darker, urban cousin". Members of the cast include: Christine Anderson, Tyson Bailey, William Burleson, Lainey Catalino, Allison Eddyblouin, Thalia Eddyblouin, Andrea and Tom Handel, Judy McQuillen, Beth and Mike Rowe and Stephen Wallace. Mark your calendars in JULY for this lively, fast-paced production that explores the joys and pitfalls of relationships and is sure to have audiences laughing, gasping and wiping away a tear or two. ​River Company in Damariscotta/Newcastle will be having auditions for John Cariani’s play, Love Sick, on Saturday, May 7 from 2-4PM and on Monday, May 9 from 6-8PM at the LCTV studio, 29 Sheepscot Rd., Newcastle, ME 04553. Performances will be held at the Porter Meeting Hall in the Skidompha Library, Damariscotta on July 8,9,15 & 16 at 7:30pm and July 10 & 17 at 3:00pm. This play consists of 9 short plays, each play has 2 characters that can be of various age ranges (25-75); people may be cast in more than one play, so there are parts for potentially 2-9 actors and 2-9 actresses. Sides will be available to read from; you may come prepared to do 1-2 short monologues no more than 5 minutes total. 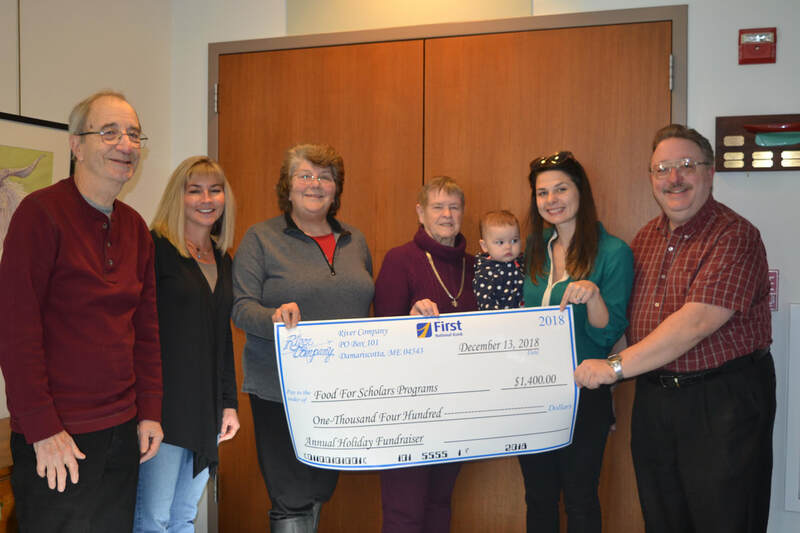 (from left to right) Andrea Handel, ElderCare Network executive director, Mallory Adams, River Company board member, Kerry Genthner, Hodgdon Green caregiver and Lilah Blechman, Hodgdon Green resident gather to accept River Company's donation. 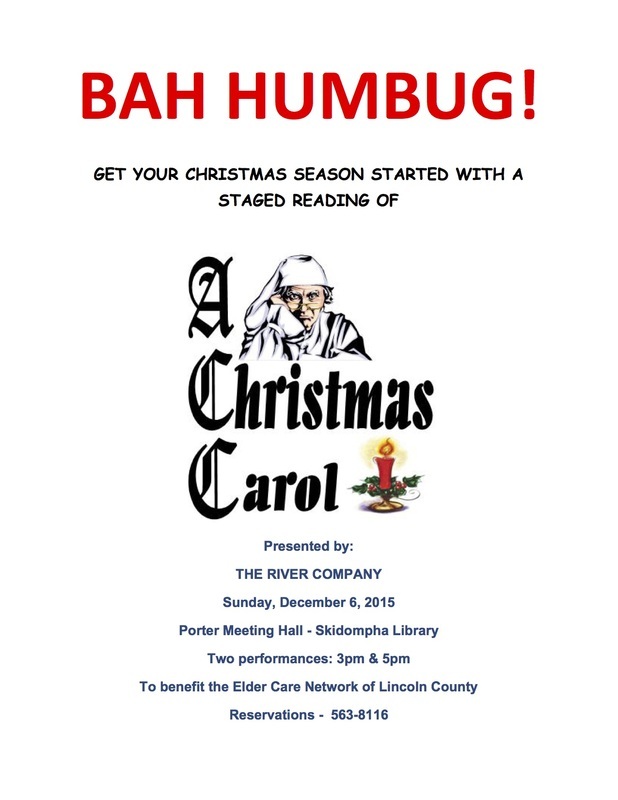 ​River Company is pleased to announce that the staged readings of A Christmas Carol presented on December 6th in the Porter Meeting Hall of the Skidompha Library raised $1000 for the ElderCare Network of Lincoln County, a local nonprofit that provides an array of services to seniors. The performances were cast, staged and directed by Margo O'Leary of Newcastle, a former River Company board member. "I'm so glad to be doing the 2nd annual reading of A Christmas Carol with such a talented and fun group of volunteers acting for a good cause," commented Margo. On Saturday, River Company board member Mallory Adams and ElderCare Network staff and residents at Hodgdon Green gathered in front of the Christmas tree to accept the generous donation. 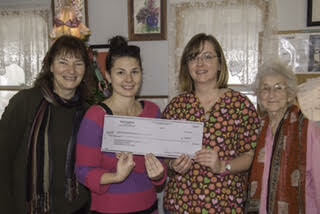 ElderCare Network executive director, Andrea Handel stopped in to accept the donation. "All of us at ECN are grateful for the outpouring of generosity from our local community as well as supporters from away. Every gift received enables us to continue our important work supporting elders and assures that we'll be able to continue in the future." River Company is a local nonprofit theatre company founded in 1998 with a mission to produce dynamic, minimal-style productions by major playwrights with a focus on acting and storytelling. For more information, visit our website at www.rivercompany.org. 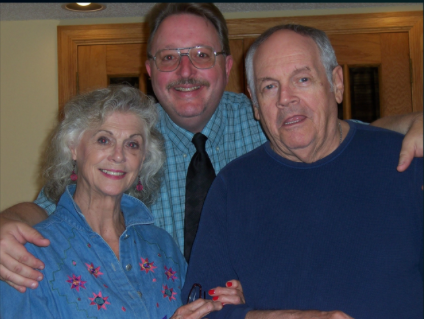 ( from left to right) Ann Foskett, Mitchell Wellman and Charles Waterman stars of River Company's fall show: The Outgoing Tide. River Company is pleased to announce the cast of its fall production, Bruce Graham's The Outgoing Tide. This full length drama tells the story of Gunner, a strong-willed husband and father who finds himself struggling with a diagnosis of dementia. Painfully aware of his increasing memory loss and the physical and emotional toll his condition is taking on his wife and son, Gunner experiences a glimpse into a dismal future in which he faces losses of physical ability, mental acuity and ultimately loss of dignity and control over his life. Bruce Graham's play follows Gunner in his decision to take matters into his own hands by concocting a plan that meets with resistance from his family. ​CHRISTMAS FUNDRAISER for ElderCare Network of Lincoln County. All ticket sales will go to that nonprofit to support low-income seniors. Tickets are $15 for members, $17 for non-members and $5 for seniors and students. Cast members Suzanne Rankin, Mitchell Wellman, Tom Handel and Andrea Handel look on as Director Ann Foskett presents John Price with his RICO Award in recognition of his having participated in ten River Company productions as either actor or director. In July John Price played the dual roles of Grandpa/Uncle Roger in River Company's production of A.R. Gurney's Ancestral Voices. Not only did John shine in this role, but it marked his tenth production with River Company, as either actor or director. River Company awards their RICO to such dedicated and talented members of the Company. The presentation to John was made by Director Ann Foskett, along with other members of the cast and Board after the last performance of Ancestral Voices. Needless to say John received the standing ovation he deserved, not only for this particular performance, but for all those that went before. River Company will continue their 2013 season with Noel Coward's Blithe Spirit, opening on October 11, at Skidompha Library, for two weekends. This production will be part of the Pumpkinfest celebration, and River Company will also be coordinating street performances on Theatre Street, which will be blocked to traffic for Saturday and Sunday, October 12 and 13. Lincoln County News Reviews "Taming of the Shrew"
Boothbay Register Reviews "Vanya and Sonia and Masha and Spike"
Coastal Journal Reviews "Vanya and Sonia and Masha and Spike"
Lincoln County News Previews "A Dickens of A Christmas Carol"
Lincoln County News Reviews "LOVE/SICK"
Lincoln County News reviews "Over the River and Through the Woods"